If you have a patient with a complex back or neck problem who requires surgery or may need a consult for a complex spine problem, you can access the expertise of Northwest Florida Spine for the benefit of your patient by calling 850-481-8752. Philosophically, Northwest Florida Spine emphasizes conservative and non-surgical treatment options where possible. This Internet site represents an online encyclopedia on back pain and neck pain. 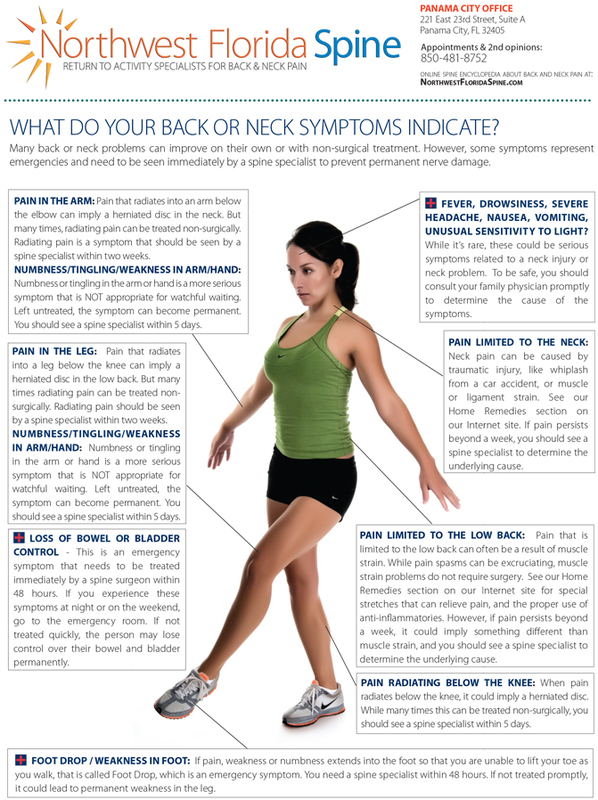 PanamaCitySpine.com has symptom charts, medical illustrations, and customized stretches that can relieve some simple back and neck pain symptoms. We also have a 36-page Home Remedy Book on back and neck pain. If you’d like a copy for your patients, contact us at 850-481-8752 and we will send 20 copies to your office for your patients. Over my career, I’ve performed more than 2,000 successful spine surgeries and am convinced of the benefits of using the advances in spine for the benefit of the patient — even though it can take a commitment of time to stay current with these new procedures. Clinical outcomes research now clearly supports the use of artificial discs for the cervical spine to reduce “adjacent segment disc degeneration” that occurs with spinal fusion. While fusion has been the historical option for dealing with herniated discs in the neck, it has been shown that locking vertebral segments in the neck increases the stress placed on the remaining discs in the neck, causing additional disc herniations. Because the artificial disc retains normal motion, it reduces the risk of disc herniation at adjacent levels. In 2016 there are now two artificial disc options that are FDA-approved for two levels in the cervical spine: Mobi-C and Prestige. Northwest Florida Spine was one of the first centers in Florida trained to use the Mobi-C artificial disc for one or two levels in the neck. So we have offered that advance to our patients already in 2016. As of 2017, the new standard is to perform spine surgery through a half-inch incision using tubular retractors about the width of a ball point pen. This replaces the old school method of an open 3-inch incision. While larger incisions are easier for an older surgeon who trained in the 1980s, this dated approach certainly does NOT benefit the patient who experiences: increased blood loss; the need for outside blood; increased pain after surgery and during recovery; and having to stay in the hospital rather than go home the same day. Northwest Florida Spine has been using MIS techniques for the past couple years. New 3D robotic technology has entered the spine surgery field to lessen risk with more accurate guidance for the spine surgeon. The robotic technology guides the surgeon’s instruments during spine surgery to reduce the use of fluoroscopy and lessen the disruption to nearby muscles. Northwest Florida Spine will be one of the first in the region to use robotic technology early in 2017. Sadly — with all the above said — too often we encounter patients who had found their way to older surgeons who still rationalize the merits of 3-inch long open incisions and aggressive fusions. With this older approach the blood loss is greater, the hospital stay is longer, the recovery longer and more painful — and the outcome can sometimes create failed back surgery syndrome which can affect the person for their lifetime. So while the specialty of spine has moved forward in 2017, there are those who haven’t. In a sense, these older surgeons are offering their patients state-of-the-art spine care circa 1990. Patients can be referred to us by calling 850-481-8752.